Kanada-Ya on St Giles High Street opened its doors in September 2014 and has since cultivated a large following with its special brand of ramen. Kanada-Ya is the brainchild of the award winning tonkostu broth master Mr Kanada who has been making ramen in Japan since 2009. It specialises only in tonkostu ramen and does not stray into shio, shoyu or miso based broths. The secret to Kanada-Ya’s success is its specially cooked 18-hour pork bone tonkotsu broth which is tended to overnight. There are three different types of ramen bowls available – the original, the moyashi (a lighter broth) and chashu-men (ramen finished with a chashu collar). 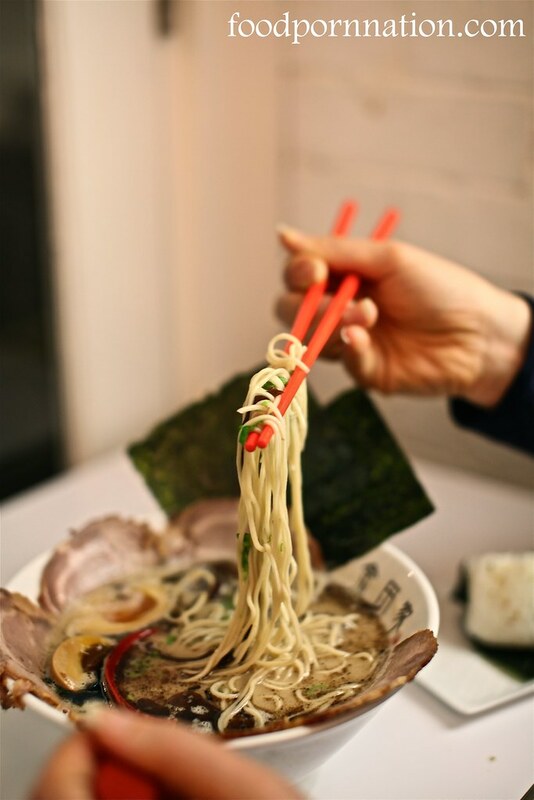 The word ramen is taken from the Chinese word ‘lamien’ which means ‘hand pulled noodles’ and the ramen at Kanada-Ya is literally that – hand pulled noodles prepared on site by their very own noodle whiz. 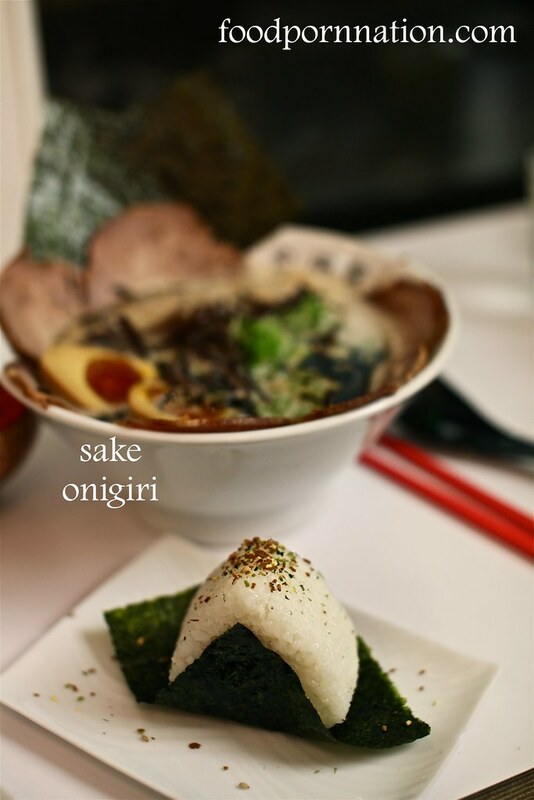 Kanada-ya also serve onigiri (Japanese rice balls wrapped in nori) that can be washed down with a selection of Japanese beers, sake or soft drinks. Like Kanada-Ya’s menu, the décor is simple and basic. But it does the trick as ramen is Japanese fast food rather than a lingering sit down dining experience. But Kanada-Ya has become so popular that there are often queues which can lead to about a half hour wait. 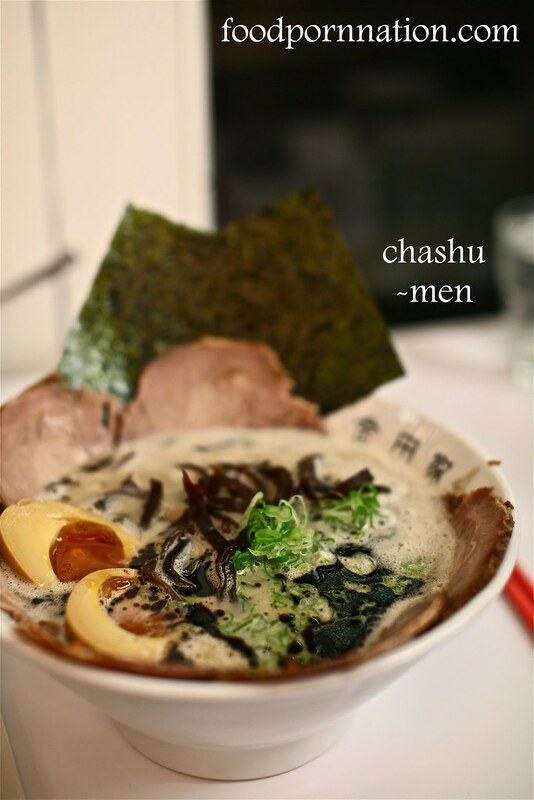 The chashu-men (£12.50) caught our eye with the promise of an extra chashu pork collar. The tonkotsu broth was delicious – smooth, creamy, fatty and frothy; full of depth and beautifully rounded. The ramen was cooked to order; very firm, firm, regular or soft. We tried both firm and regular and we found the noodles perfectly cooked to order and that they had been pulled to an exact thinness that was lovely and chewy. The chashu is made using the neck so it is far leaner than that of pork belly. Extra gold label seaweed (nori – £1), chashu cured burford brown egg (hanajuku egg – £2) and the charred black garlic oil (Ma-yu – £1.50) can all be ordered as additional extras. We tried and loved them all. The hanajuku egg was an egg cured with chashu (pork pieces) and was something special. It was both beautifully sweet and savoury and exuded a lovely warm brown glow with a golden gooey centre. The shiny charred black garlic oil was as dark as the night and filled the air with delicious stinky garlic aroma that enhanced the flavours of this brilliant ramen. The nori was excellent with a lovely flavour. Shoryu Ramen was launched in November 2012 by the team at Japan Centre and Shoryu have quickly gained a following for their ramen. They now have locations spread across Carnaby, Regent St and Soho. 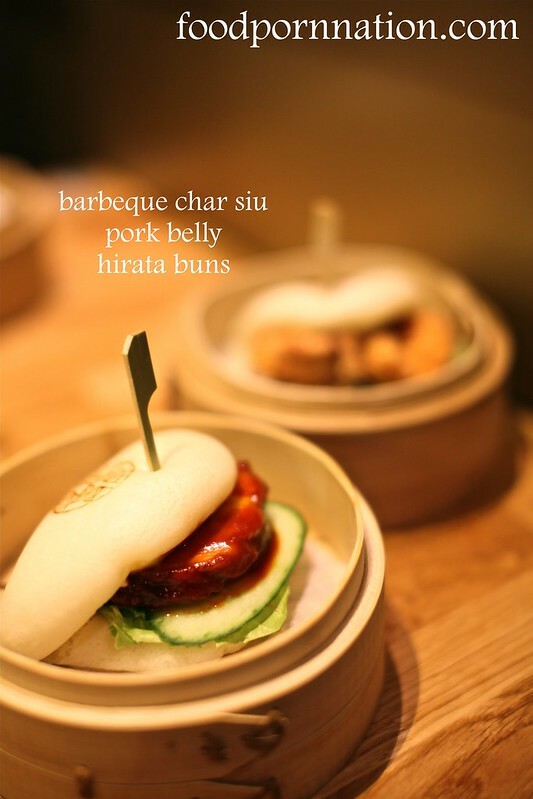 If ramen wasn’t enough, they also dish up the very popular hirata buns, sushi, sashimi and yakitori as part of their sides menu. Recommended in the Michelin Guide 2014 and 2015, Shoryu have come head to head with the likes of Bone Daddies and Tonkostu Ramen. These are the three amigos that are dominating the Soho food scene with their ramen. What makes Shoryu really special is that they specialise in the Hakata style tonkotsu ramen from the Hakata district of Fukuoka city of Japan. They promise that this is a bonafide tonkotsu ramen which you will rarely find outside of Japan. Thanks to Executive Chef Kanji Furukawa, who was born and raised from the region. Londoners can now enjoy the Hakata style ramen made with a thick, rich, white pork soup and thin, straight ramen noodles. This style of ramen is my absolute favourite, so I am really looking forward to see what Shoryu has to offer.